If using flexible silicon molds, spray lightly with cooking spray, and then wipe out well with paper towels. This will leave a slight reside which will help remove the jelly shots without impacting the taste or appearance. If using a standard 1 lb non-reactive metal or glass loaf pan (approx 9 x 5), no prep is needed. Fill the cocktail shaker 1/2 full of chopped fruit, and muddle vigorously (set remaining fruit aside to for garnish). Add the wine to the cocktail shaker, shake for a minute or so and set aside (no ice is needed). Pour water, lemonade concentrate , juice and soda into a small saucepan and sprinkle with the gelatin. Allow the gelatin to soak for a minute or two. Heat over very low heat until gelatin is dissolved, stirring constantly, about 5 minutes. Remove from heat. Strain the wine mixture (you should have about 1 1/4 cups of liquid, and stir into gelatin mixture along with the Cointreau™ and vodka. Pour mixture into loaf pan or molds. Place in refrigerator to set (several hours or overnight). To serve, cut into desired shapes or unmold. Place each shot in an appetizer spoon, and garnish with chopped fruit. Ah, the bottle of “mystery white” wine. You can’t quite recall where it came from - the bottle is completely unfamiliar and sports either a jarringly flashy label or is completely nondescript. It may have come from the pot luck you hosted last spring, that big wine closeout sale, or perhaps was in your “secret santa” stocking at the office three years ago. While admittedly too scary to open at dinner, a bottle of mystery white, regardless of its origin or purported varietal, is perfect for one thing, and one thing only . . . SANGRIA! And what’s better than batch of Sangria on warm summer days? 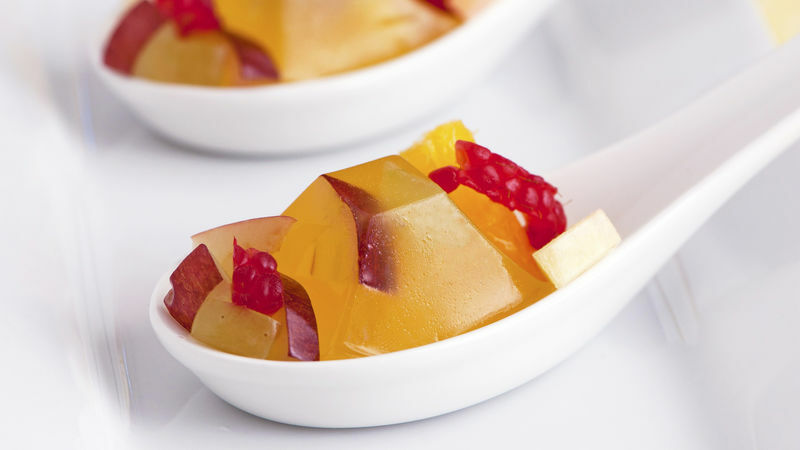 A White Wine Sangria Jelly Shot, served in cute appetizer spoon and garnished with finely chopped fresh fruit! This recipe is one of my favorites for patio entertaining, and I usually do serve these jelly shots in an appetizer spoon. The spoon is helpful for climate control issues, as the jelly shots can get a little hard to wrangle in warmer weather. The recipe includes an extra 1/2 envelope of gelatin to further bolster against heat and humidity. Feel free to use whatever fruit you have on hand. I always like grapes, oranges, and apples, but the berries are a nice touch if you have extra. As the fruit is very finely diced, you will be surprised how few teeny tiny pieces you actually need! The jelly shots were prepared in a flexible silicone mold. Variations abound of these silicone molds abound, and can be purchased in specialty kitchen stores as well as a variety of retailers. Hope you are able to use up a bottle of your own “mystery white” soon!